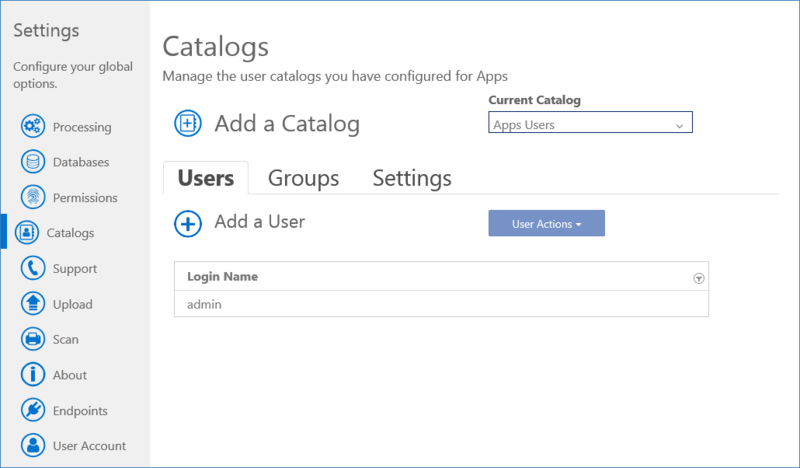 On the Configuration app’s Catalogs page, you can add user catalogs to the farm, which are lists of users and groups who can be assigned permissions in Apps. Catalogs can either be local, consisting of users and groups that you create, or linked to an external source such as Active Directory or Azure Active Directory. For more information on Users, reference the Users Configuration Article. For more information on Groups, reference the Groups Configuration Article. Click Add a Catalog. The Add a Catalog wizard will open. On the Welcome page, configure the basic settings for your catalog, and then click Next. On the Catalog created successfully! page, click Save. On the Welcome page, configure the basic settings for your catalog. On the Connect to a Domain page, configure the domain controller. To use the domain controller that the server is connected to, select Current Directory. To specify a domain controller, select Remote Directory, and configure the Active Directory server information. NOTE: It is recommended that you do not use an account with an expiration date as the domain administrator account. NOTE: For more information about configuring a remote directory, refer to the technical documentation. On the Admin Consent page, click the Give Admin Consent. The Microsoft Sign In page will open in a new browser tab. On the Microsoft Sign In page, sign in to your Azure Active Directory account. Click Accept to grant permissions to Capture Server Pro, and then click Yes to grant access. On the Admin Consent page, click Next Page. On the Authentication page, click the Grant Access. The Microsoft Sign In page will open in a new browser tab. Click Yes to grant access. On the Authentication page, click Next Page. On the Settings tab, type a new Catalog Name. On the Settings tab, click Delete Catalog. The Delete Catalog window will open. On the Delete Catalog window, click Confirm.